As Lavrov's achievements in the negotiations regarding the destruction of chemical weapons in Syria put him in the spotlight, RBTH takes a look at the man beyond his political persona. The agreement on the destruction of Syrian chemical weapons, which was reached on September 14, 2013, has been the first major deal between Moscow and Washington in recent years. It has therefore put an international spotlight on the Russian foreign minister, Sergei Lavrov, who brokered the deal. Some commentators have even declared that the agreement on Syria will come to be seen as the pinnacle of the minister’s diplomatic career. Lavrov himself, who has held the office for almost a decade, never speaks of his own achievements. Every outcome receives various—sometimes diametrically opposing—assessments by colleagues, partners, rivals and, eventually, future generations. What can a professional diplomat do in these circumstances? Strangely enough, one possible answer to that question can be found in Lavrov’s own poetry. One of his lines reads that the intention “to press ahead stubbornly to the goal” is key. Writing poetry is one of the Russian foreign minister’s favorite pastimes, and he wrote his first poem when he was a student. His favorite books include “The Catcher in the Rye” by J.D. Salinger and “The Master and Margarita” by Mikhail Bulgakov. Lavrov’s friends describe him as very companionable; he likes to sing, play the guitar and drink whisky. Unlike many members of the Russian elite, he spends his vacations on Russian river rapids rather than at exotic foreign resorts. Lavrov enjoys rafting, football, mountain skiing and underwater hunting; it is even said that he collects cold weapons. In addition, he is currently serving as the president of the Russian Federation of Canoe Slalom. “Mr. Lavrov is quite fit and sporty,” his former classmate, journalist and retired intelligence officer Yuri Kobaladze said once in an interview. “He has a good appetite, but his is always lean and in good shape. It probably helps that he likes to split logs and chop wood so much. Even at the Russian ambassadorial country residence in New York, he would often ask the gardeners to leave a few round logs for him to split." In the United States, Lavrov has had to not only chop wood but also cross swords in the U.N. Security Council. He had served as Russia’s permanent envoy to the U.N. Security Council for just as long as he has now spent serving as the Russian foreign minister. Did Lavrov foresee his own longevity on the diplomatic arena? What, then, has Lavrov’s career path been like so far? His official CV says that he was born in 1950; his ethnicity is stated as Russian. Lavrov’s father was actually an ethnic Armenian living in Tbilisi. During a meeting with students in Armenia in 2005, Lavrov had this to say on the matter: "Actually, I have some Georgian roots, because by father was from Tbilisi; but I do have Armenian blood." After finishing high school, Lavrov entered the Department of Asian Studies at the Moscow State Institute of International Affairs. In addition to his main specialty—the Sinhalese language—he also studied English and French. After graduating in 1972, he became an intern at the Soviet Embassy in Sri Lanka. Lavrov then made a fairly typical diplomatic career. In 1976-1981, he served in the Soviet Foreign Ministry’s Department for International Organizations. In 1981-1988, he held the positions of first secretary, advisor and senior advisor at the Soviet mission to the United Nations. In 1988-1990, Lavrov was the deputy head of the Department for International Economic Relations at the Russian Foreign Ministry. In 1990-1992, he served as director of the Foreign Ministry's Department for International Organizations and Global Problems. In 1992, Lavrov was appointed deputy foreign minister under former Foreign Minister Andrei Kozyrev. Two years later, he left on a posting to New York as the permanent Russian envoy to the United Nations. The appointment marked an important turning point in his career. During his long years at the U.N., he had to deal with all the key international issues. He took part in U.N. discussions on the conflicts in the former Yugoslavia, Iraq, the Middle East and Afghanistan, as well as meetings focusing on the fight against terrorism. He was first slated to replace the outgoing foreign minister, Andrei Kozyrev, in December 1995, but the Kremlin appointed Yevgeny Primakov instead. In 1998, Primakov was succeeded by Igor Ivanov. Lavrov’s turn came only in 2004. Over the years, Lavrov has had to deal with all sorts of international issues. He has argued with the Americans about missile defense and democracy in Russia. He has signed an additional agreement on the Russian-Chinese border, which is the world's longest land border. He has discussed a peace treaty with Japan, in an effort to end the territorial dispute between the two countries. He has been closely involved in attempts to solve the Iranian nuclear problem. The foreign minister had to explain to the whole world the Russian position during military operation against Georgia, which many feared would spiral into a conflict with the United State; he then led the negotiations on the subsequent settlement in the Caucasus. Of course, he has been doing his best to strengthen the Russian positions in the Middle East; that particular task was further complicated by the revolutions in the Arab world, and by the armed conflicts in Libya and Syria. Lavrov is known for his strong and decisive temperament. In 2008, Britain's The Daily Telegraph wrote that he became very angry during a phone conversation with his British counterpart, David Miliband. The newspaper claimed that Lavrov’s tirade was so full of “F-words” that it was difficult to draft a readable note of the conversation. Some foreign diplomats have given the Russian foreign minister the moniker "Mr. No.” The former U.S. secretaries of state, Hillary Clinton and Condoleezza Rice, admit that their Russian counterpart could often be infuriating. Predictably, differences with the United States have been at the forefront of Lavrov’s pronouncements and Russian foreign policy documents in general. Incidentally, the minister had once compared Russia’s relations with America to various dances. “Waltzing is, by definition, going in circles. So waltzing isn’t going to cut it, obviously. As for tango, it has some rather abrupt moves. We have already tried the twist. So two steps forward, one step back actually represents some progress. 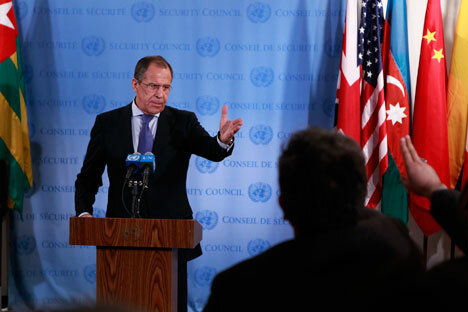 This is an entirely positive trend,” said Lavrov. The minister, it appears, can be both diplomatic and witty at the same time. “Russia is still clinging to the wreckage of the Potsdam and Yalta system of international relations. Moscow backs this particular iteration of the international system because, being the successor of the Soviet Union, Russia benefits from such a system. Russia perceives national sovereignty as the foundation, and it has a clear interest in preventing any kinds of unilateral intervention without the authorization of the U.N. Security Council, where Russia has a veto. Lavrov is very firm and consistent in pursuing that particular course,” Markedonov said. The scholar believes that Lavrov has earned himself an international reputation as a respected professional, regardless of the various attitudes to Russia itself.